Making exterior mobile home improvements to your mobile, modular, or manufactured home not only adds value but also creates charm, comfort, and wonderful pride of ownership. Mary and I are excited to bring you what we believe, are several exterior home improvements specifically designed for mobile or manufactured homes. Check out the four ideas below and then use the link at the bottom of the page to see the other five. 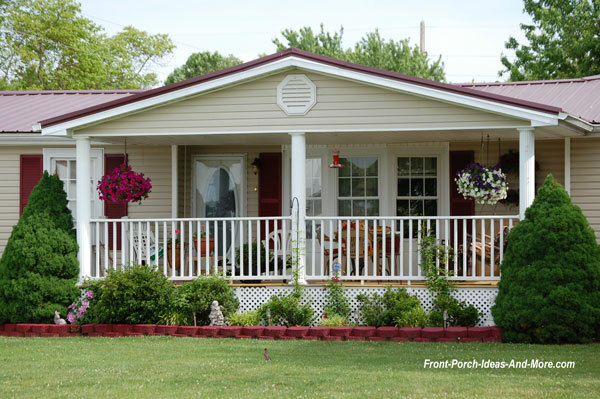 Front Porches and Mobile Homes Just Go Together! Mary and I love that many home improvements for mobile homes make for great DIY projects which are not only fun to do but also can save you money. For some improvements; however, it may be wise to hire a reputable mobile home contractor to ensure the work is performed correctly. 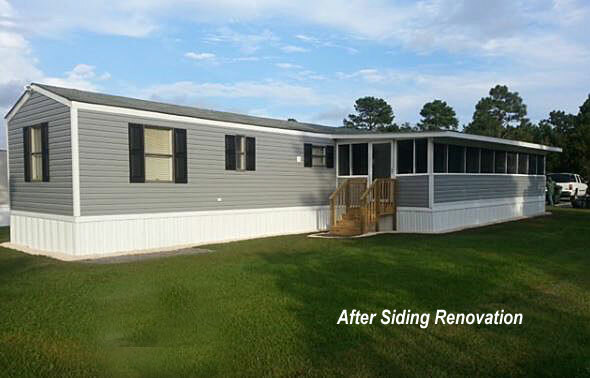 See what can be done to enhance the look (and love) of a manufactured home by making both interior and exterior mobile home improvements. When thinking of exterior mobile home improvements, your manufactured home deserves the best. One way to instantly improve its appearance (and your love for it) is to update the siding. You can change the color, style, material, while making it more energy efficient too. 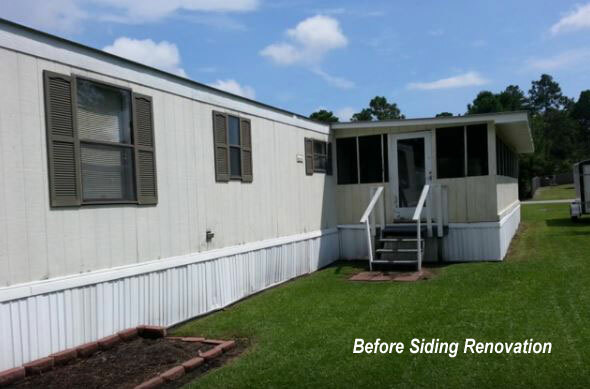 You may also want to check out Crystal's article in Mobile Home Living for more detailed mobile home siding information. Replacing your front door adds immediate appeal to almost any home and is one of our favorite mobile home improvement ideas. What better way to greet friends and neighbors than by having them encounter an energy efficient and beautiful entranceway. You can even do it yourself or use our convenient contractor locator to do it for you! 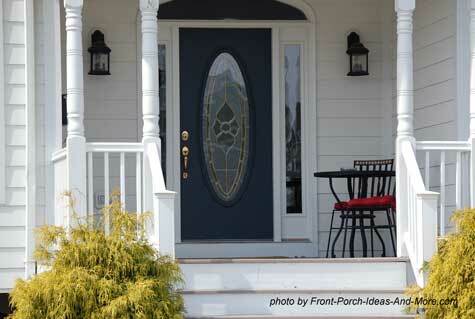 Explore more front door options and ideas! Today's windows are not only energy efficient but also operate more easily. Reduce your energy bills and have a more modern look. Mary and I know replacing windows is probably not on anyone's "most fun and exciting thing to do" list! It definitely wouldn't be on ours. However, there are times when you really need to replace them. So if your windows need an upgrade consider windows specifically made for manufactured homes to ensure you get the best fit, style, and ultimate value for your money. 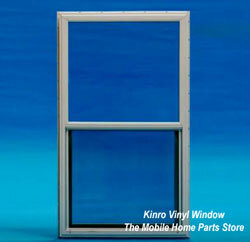 Here's a short video showing the advantages of a Kinro Vinyl Window for your mobile home. Handy? Save money by installing your windows yourself. Check out this DIY window replacement video that shows you how to do it! 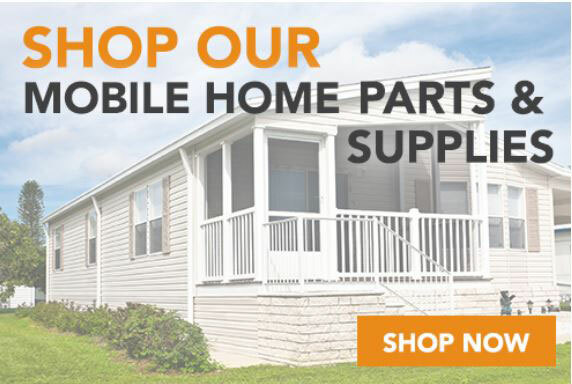 You can find these windows and more at the Mobile Home Parts Store. We like their selection of products for the porch and exterior of your home! 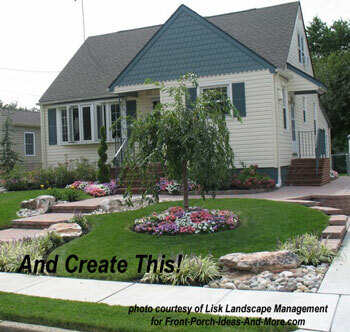 Creating wonderful landscaping around your mobile or manufactured home adds lots of curb appeal and is easy to do. 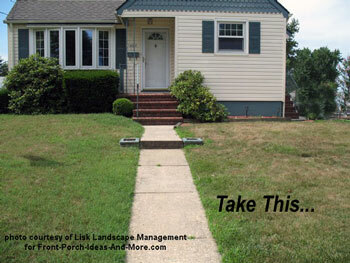 There are simple things you can do to enhance the look of your yard. No matter your budget, adding attractive landscaping makes your home just so much more appealing. Even if you do not have a green thumb, there are simple ways to create colorful arrays. And you don't have to make all the changes at once. Create a plan and then add plants and walkways as time and money permit. I enjoy finding pictures of landscaping I like and then replicating them in our yard. Local gardening stores can help find the same or similar plants that will work well in your geographical area. Don't have the space? Container gardening and hanging planters are convenient ways to add color and landscaping with minimal space. Spend some time in our front yard landscaping section to get lots of ideas you can use for your home. Whether you have a small portico, a smaller sized porch, or perhaps a wrap-around, adding outdoor decor along with comfortable furniture makes for an enjoyable outdoor experience. 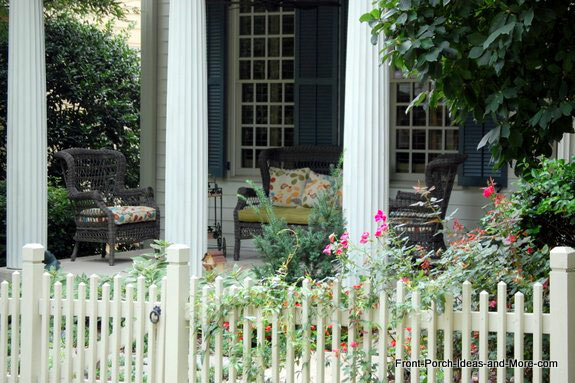 There are a myriad of ways to decorate your porch, patio, or stoop to create curb appeal (and for your enjoyment too!). Whether it be for holidays, the seasons, or special events your want to celebrate, decorating your home is easy, fun, and can be relatively inexpensive. 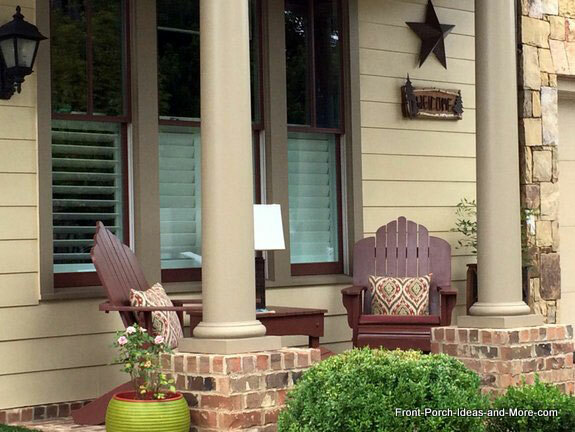 Need porch decorating and furnishing ideas? We have a slew of mobile home decorating ideas in our porch decorating section and our porch furniture sections for you to see! Mary and I couldn't help but give you a bonus idea. 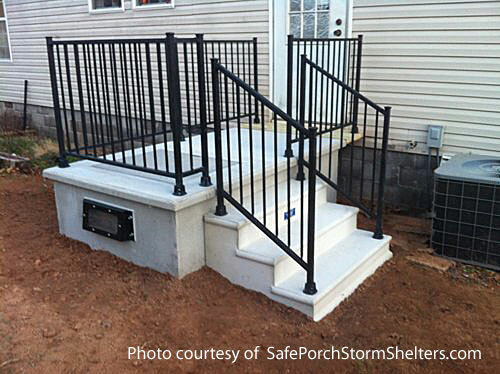 Protect you and your family with a SafePorch Storm Shelter. These are ideal for mobile home owners or those whose homes are built on slabs. Visually appealing, the SafePorch doesn't even look like a typical storm shelter. In fact, it can double as your porch, deck, or patio if so desired. Learn more about this innovative idea. Just a few more exterior mobile home improvement ideas to explore, if you'd like!